President and CEO of American Ultraviolet, Mr Meredith Stines, visits with Consultants in conjunction with the launch of ecoHVAC’s distributorship of HVAC UVC Germicidal Light Solutions. 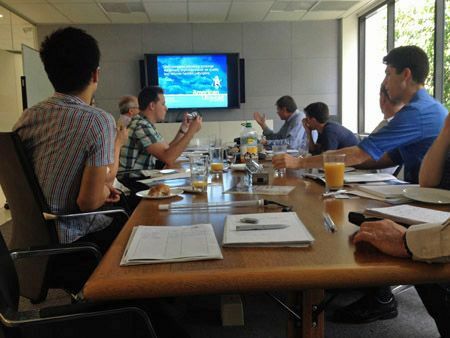 Presentations to Consultants in Brisbane and Sydney were arranged to advise them of the health and cost saving benefits of UVC Germicidal Lights. Since 1960 American Ultraviolet has manufactured 100,000+ effective UVC germicidal fixtures for healthcare, industrial, commercial, and residential applications, including HVAC, hospital, pharmaceutical, laboratory, food and beverage manufacturing and processing, among others. American Ultraviolet also manufactures a wide range of in-duct UV HVAC air duct system equipment, on-coil HVAC UV air handling systems, in-room HVAC UV light systems, Operating Room UV packages, and ultraviolet germicidal fixtures for numerous applications. This includes commercial buildings, hospitals, clinics, food and beverage processing plants, offices, restaurants and commercial kitchens, and manufacturing sites, among others. For more information call us on 07 3808 9400 | 02 9669 4500 | 03 9646 2211 or visit our HVAC UVC Germicidal Light page.